At Centerless Grinding Service, we are a trusted industrial resource for high precision bar materials. 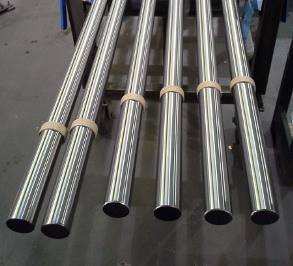 For this project, a customer in the power generation industry contracted with us to grind, polish, and precision straighten 17,200 lbs of 24' long 410 HT stainless steel bar and prepare it for international shipment. From the receipt of material and throughout all of the processing, up to and including packaging for export, real-time inspections conducted by on-site client representatives ensured we adhered to all industrial codes and compliance mandates. Delivered with dimensions of 1.812" in diameter, we ground the bars to a perfectly round diameter of 1.752" and 32 RMS max surface finish. We consistently held a close +0.000"/-0.002" tolerances and T.I.R. of 0.080" per 100" of length. Continuous dimensional and visual inspections validated that we met all critical requirements of the customer specification. We recorded the results of our quality assurance activities in order to supply the required certificates of conformance and traceability documents. In addition, we observed specific energy-industry best practices as well as import/export regulations for packaging, marking, and loading the steel products for shipment overseas. Our proven experience, expert craftsmanship, and ability to provide our customers with an elevated level of service commitment enabled us to meet the two-week time constraint for this project. If you are interested in learning more, or how our ability to provide value-added services can benefit your operations, contact us today.